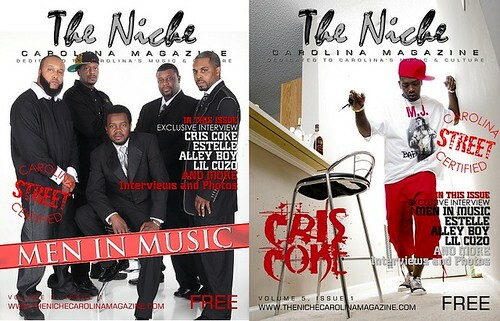 The newest issue of The Niche Carolina Magazine is now available! This months’ edition features "Men In Music", highlighting gentlemen who are in business in and around Greenville, SC. There is also an interview with Estelle, in addition to DTE’s Alley Boy, conducted by yours truly. Print copies are available on newstands and multiple outlets throughout South Carolina and North Carolina. You can also read the issue online right here. Also don’t forget, the 5th annual South Carolina Music Awards are coming in July. The location of this year’s festivities will be announced soon so stay tuned to the site for more details. This entry was posted in Interview and tagged Alley Boy, The Niche Carolina Magazine. Bookmark the permalink.